What are VBA cell references? After creating the macroVBA MacrosSetting macros in Excel VBA is fairly simple. The structure for Excel VBA macros involves starting with a sub() line before beginning the macro code. Macros use the Visual Basic Application in Excel to create custom user-generated functions and speed up manual tasks by creating automated processes. and declaring the variables, the next step is to create VBA cell references, which actually refer to each variable and that can then be used to manipulate the data within the Excel sheet. Performing the actions on variables for data reference are known as VBA methods. To do this, you will need to know the different methods you can apply within VBA. The ideal first step is to learn how to refer to specific data cells. To know which data it needs to manipulate, you need to tell Excel where to find the data. This is done in the following hierarchy: Workbook (Excel File) > Worksheet > Range or Cell. If you skip levels of the hierarchy, Excel will simply assume that it should look in the currently active Workbook or Worksheet. You cannot skip the last level. You need to tell Excel a specific range or cell, or tell Excel to look in the active cell. Telling Excel which workbook and worksheet to look under is not necessary, but is valuable when multiple workbooks and worksheets are open. To refer to a workbook: Workbooks(“NameOfFile.xls”). Use the specific name of the file, followed by the extension. Use the name of the sheet. Selecting ranges and cells works a bit different as compared to the selecting books and sheets. You can select one or more cells (known as a range), or even multiple ranges. Looking at the code, you may be familiar with it, as the text enclosed in the parenthesis is similar to that used in Excel formulas. 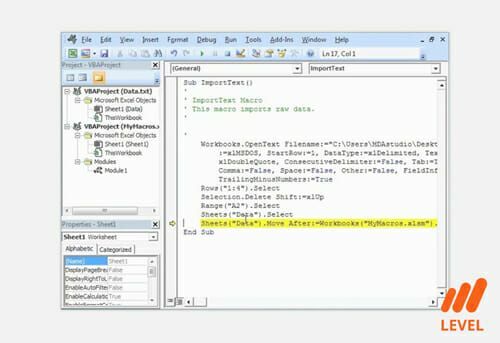 This is the VBA cell reference that Excel needs to find the data you want to work with. However, now you need to tell Excel what to do with the data. This is where you start working with methods. From here, it gets a little complicated. Each reference has many different actions (known as “methods”) that it can take, and certain references have methods that are unavailable to others. However, to keep things simple, let’s discuss how to tell Excel to select and highlight the data in the model, how to copy it, and how to store it. To highlight the data in the model, the proper method to use is “Select” or “Activate”. Running this macro by pressing F5 will cause Excel to highlight the range A42 to D45. To copy the data in the model, the method to use is “Copy”. Running this macro will tell Excel to copy the contents of the range to be pasted later. If you run this macro, you’ll notice that Excel will highlight the range with the “running ants” that you normally see when you copy data. To access the value in a Cell, you use the “Value” method. Using value, you can store the value in a cell within a variable, or copy the exact value of that cell into another cell. Note that the value command does not work with ranges, and will only work with singular cells. Macros will always read from left to right. This means that Cell A45 will now contain the value within Cell A42 after the macro is run. To store the value of a cell in a variable, you use the “Value” method, but you must also tell Excel which variable to store it under. This action won’t work for a range, as Excel can only store one piece of data within each Variable. If, for example, range A42 contained the phrase “Corporate Finance Institute”, it would be now stored under the myVariable string variable. You can use this method to store values for later use. This action is also useful when you need to use the same piece of data multiple times, so you don’t have to type the long reference each time. Instead of typing the workbook, sheet and range, you can simply use the variable you stored it under.